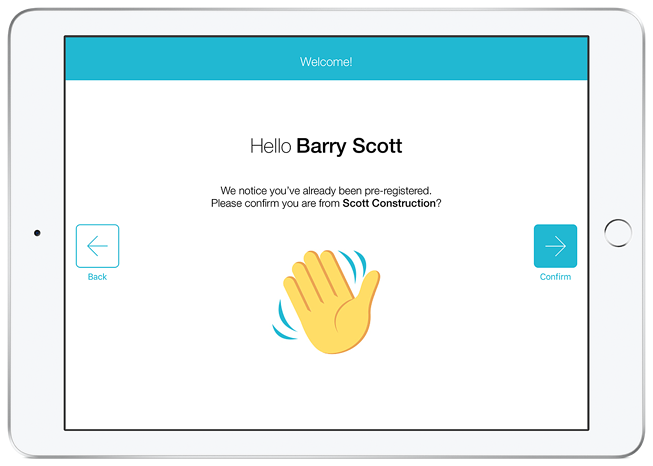 Enhanced privacy controls, better access and management of your data, and UI improvements to the iPad application. May has been an extremely productive month for everyone here at SwipedOn - particularly in our Product and Development team. This month has seen the team focus on delivering the many features required for GDPR compliance. We’ve not only shipped these specific features, but we’ve also dramatically improved data access and management for all our users - regardless of whether they are bound by the GDPR or not. Like many businesses, we've been hard at work bringing to you features that aid your GDPR compliance. You'll see a few of these below and there are more to come as we further refine and improve functionality. Firstly, we are super excited to bring you some nice changes on the iOS side of things to improve usability and keep inline with GDPR. You’ll notice that our iPad app has had a small facelift. We’ve made the ‘Next’ button much more prominent so users know what to do next. We've also added some friendlier touches for your pre-registered and returning visitors. You can now use SwipedOn in portrait mode! This gives you the full flexibility to have the iPad in whichever orientation that suits your situation the best. Portrait mode is especially great for viewing and signing digital agreements. Rotate till your heart's content! 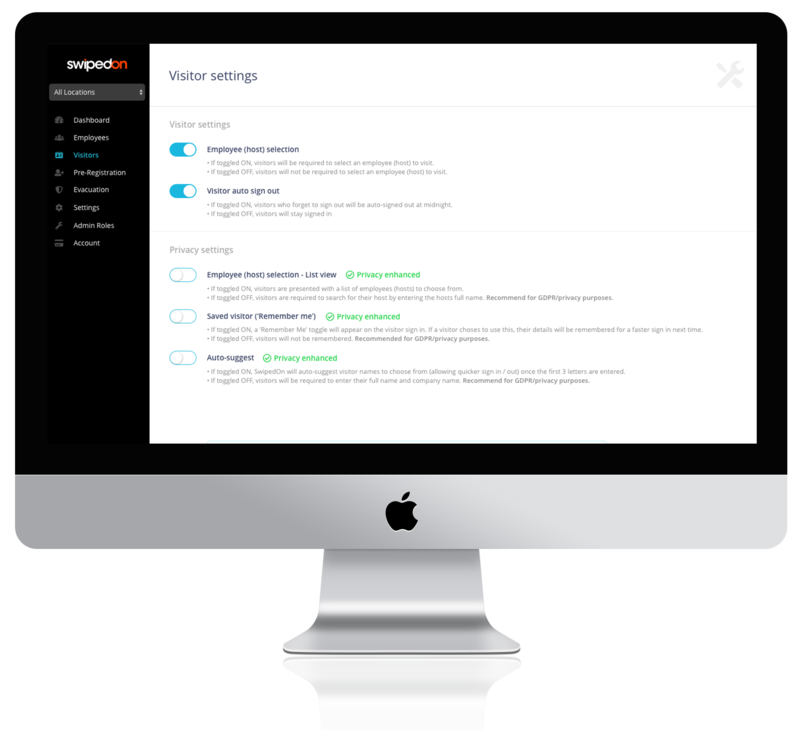 We’ve improved our visitor settings page to clearly show you what settings are recommended for added data privacy. The big change here is the ability to turn off our ‘Auto-suggest’ feature for the iPad. Turning this feature off will mean names will need to be entered in full to be matched exactly, negating any situation where a visitor with the same name is exposed to another persons name. We've made some significant changes to our visitor page. Previously, our visitor page was combining the ‘visitor’ information with ‘visit’ information, resulting in a hybrid page with mixed information. Today we are excited to introduce you to Visitors and Timeline. When you head to your visitors page in your dashboard, you will now see these new tabs. 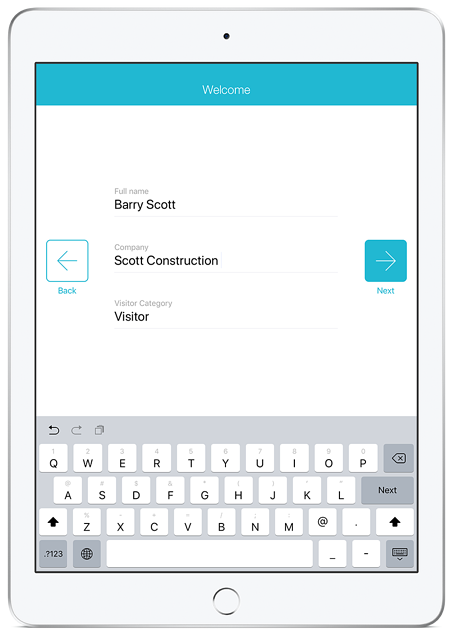 Visitors: The visitors tab now shows an alphabetical list of all the visitors that have ever entered your building, with details of their last visit and a quick ‘sign in’ or ‘sign out’ button. 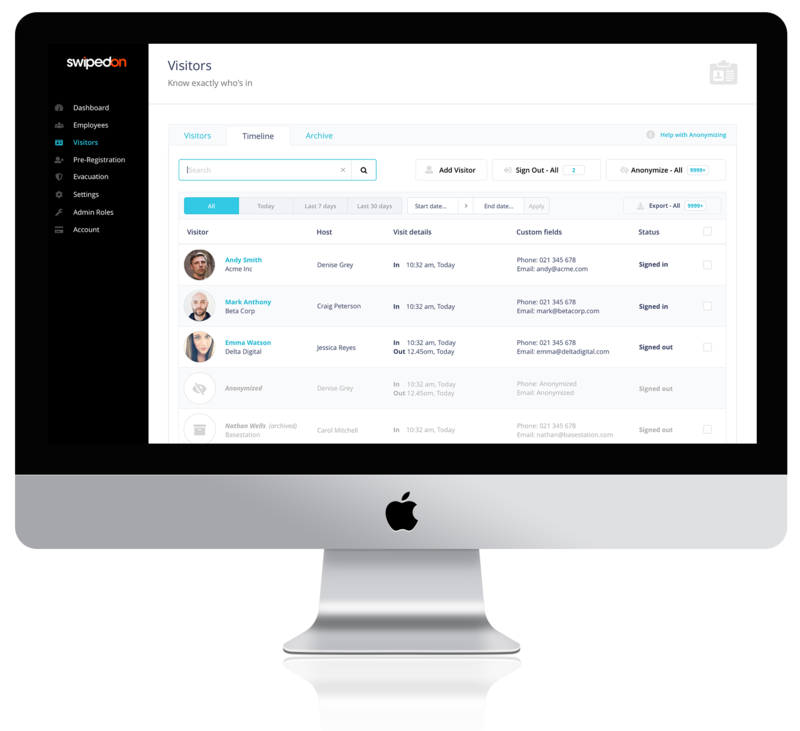 Spoiler alert: In the near future we will be building out a ‘visitor profile’ page to further improve overall visibility and functionality! Timeline: In the Timeline tab, you will now see a chronological list of all your visitor movements. This is great, as now you can search or filter results and bring back all movements that happened on a particular day, or for a particular visitor. Spoiler alert: The above new functionality will apply to the employees page too, and we will be releasing this very soon! We’ve changed the way you export your visitor data. Previously, the export would create a "Ready to download" link, which was confusing. Now, after clicking export, we simply download the file directly to your computer. We will be adding this functionality to the employee page shortly. One of the major functional changes to the system is the new ability to archive and anonymize your data - very much a function at the heart of GDPR. Previously, if you’ve deleted a visitor, we handled this by ‘soft deleting’ them - which allowed their information to be present in your exports. We have now renamed this function as Archive. Don’t be surprised to see your archive already contains some information. This is simply the information you have previously deleted. If you no longer want this, please go ahead and anonymize this information from the archive. The ability to anonymize personally identifiable information is a key aspect of data privacy. Why do we use the term “anonymize” and not “delete”? We debated this for a long time, but in the end we felt the word anonymize better explains what we are doing. When you anonymize data, you will be deleting all personally identifiable information related to that data subject. But, for reporting purposes, we retain their visit time and date stamp. That way you can still see your overall visit counts and make use of the overall metrics. You can anonymize a Visitor. This will remove all trace of personally identifiable information for that visitor, including all of their 'visits'. You can anonymize a single Visit. This is done from the Timeline tab. Here, you can search by date range and anonymize any visit you want. Note - this does not anonymize the visitor associated with that visit. Spoiler alert: We will soon be releasing an automated process to handle this!